Researchers say climate change is real, and it could be deadly for some. INDIANAPOLIS – In his second year as the baseball park president, Wayne Fant works to finish marking the infield lines at west Indianapolis’ Rhodius Park. He paces under a cloudless sky, pushing a wheeled machine that drops white powder from home plate to third base. The sweat collects on his brow as he follows a taut twine guide line. The temperature at the park is 81 degrees Fahrenheit, about 2 degrees above normal for this time of year. The early summer weather follows a longer-than-average winter. Fant said he senses something about the weather feels different. “I watch the weather forecast every morning, and they usually give what the forecast is gonna be and whether it’s below average or above average. It seems like the average is going out the window,” Fant said. Plainfield resident Wayne Fant paints the infield lines at west Indianapolis' Rhodius Park. Besides the heat, Fant said he’s also noticed rainfall increasing. He said for the past two years heavy rainfall has immersed Rhodius Park in several feet of water. 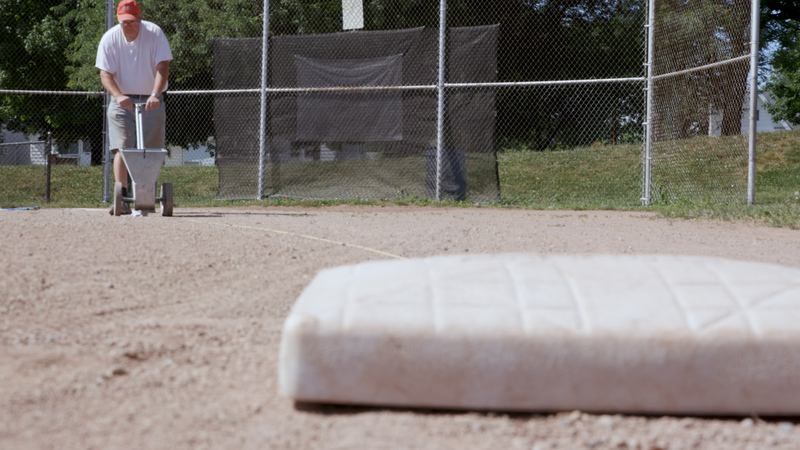 The only visible parts of the field were the tops of chain link fences surrounding the baseball diamond. “It was like one big lake. It was that bad,” he said. Meteorologists at the National Weather Service Indianapolis, as well as scientists at research institutions around the state, say climate change is real and measurable. 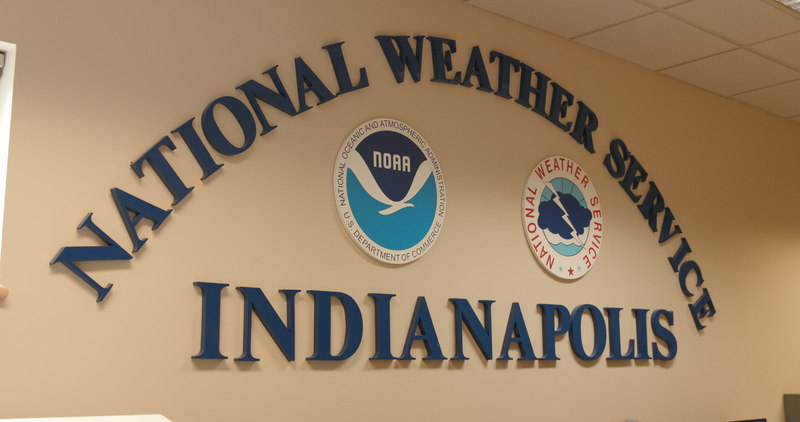 The National Weather Service Indianapolis tracks meteorological changes in temperature and precipitation amounts. Now, more than 100 experts from more than 50 organizations are working together to determine how climate change will affect the health of Hoosiers. Through the Purdue Climate Change Research Center, those experts will produce a total of nine reports that look into how climate change will affect everything from forest and aquatic ecosystems to tourism across the state of Indiana. One of the first reports, released in spring 2018, researched how climate change will affect the health of Hoosiers. The report, titled Hoosiers’ Health in a Changing Climate: A Report from the Indiana Climate Change Impacts Assessment, details in seven key findings how health is linked to climate change. The report’s main researcher, Gabriel Filippelli, a professor at Indiana University Purdue University Indianapolis and director of IUPUI’s Center for Urban Health, said the report gives lawmakers and other decision-makers state-level information they were lacking. One of the main findings of the report detailed how rising temperatures could make chronic health conditions deadlier. According to the report, Indiana’s average annual temperature has risen 0.4 degrees Fahrenheit every decade since 1960. If that trend continues, temperatures will be about 6 degrees higher by 2050 and 10 degrees higher by 2100. The sun shines brightly over Rhodius Park in Indianapolis. The higher temperatures will be even worse in urban areas. Heat-absorbing surfaces like asphalt and dark roofs intensify temperatures. The heat could prove deadly to vulnerable parts of the population. The report suggests that by 2050 about 15,000 more heat-related premature deaths per year could occur in the U.S.
Filippelli said high temperature days can also affect people with preexisting chronic illnesses. 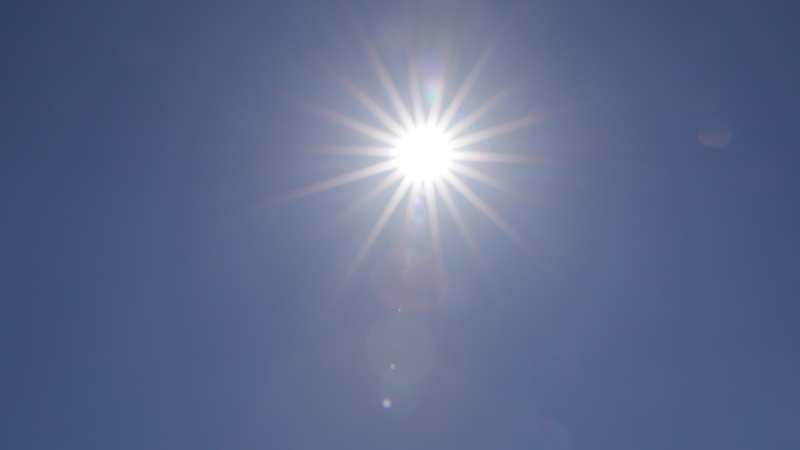 The heat causes an accelerated rate of ozone production. In high concentrations, ozone can trigger asthma attacks, heart attacks and other health problems. According to the report, researchers found that during high ozone days, people make many more emergency room visits, 911 calls and ambulance calls. According to Dave Tucek, the warning coordination meteorologist at NWS Indianapolis, Hoosiers are experiencing weather significantly different than in past decades, including changes in rainfall patterns. “We don’t experience as many near-zero days in the winter as we have in the past. We are experiencing more frequent heavy precipitation events than what we had in the past, tending to see more rainfall occurring in the winter and spring time frame and less so in the summertime,” Tucek said. Researchers found that over the last century, Indiana’s statewide annual rainfall has increased by about 15 percent, or 5.6 inches of rainfall. Those changes, though, are not projected to be distributed evenly throughout the year. Instead, researchers say the extra rain will fall in the spring and winter. Filippelli said climate change will make the rain fall in short periods of heavy rain, known as extreme rainfall events. The National Weather Service has tracked that change. 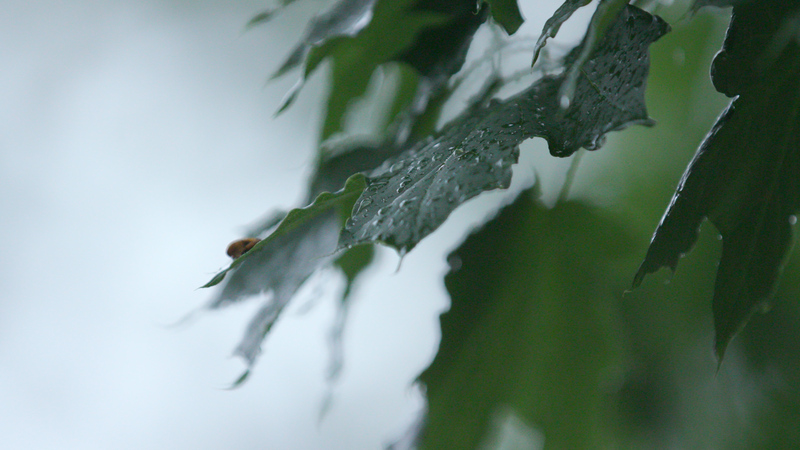 A bug rests on a leaf during rainfall in Indianapolis. That rain overwhelms a community’s ability to drain the water, causing widespread flooding that can cause economic damage as well as health problems. Heavy storms can cause drains and sewage pipes to overflow, exposing nearby residents to gastrointestinal illnesses. Standing water causes mold and mildew to build up in submerged homes. Another key finding is that climate change will increase the number of mosquitoes and ticks, potentially making Indiana vulnerable to the spread of tropical diseases. According to the report, the mosquito population has risen by 500 percent since 1981. The higher temperatures and concentrated rain events form a perfect breeding ground for mosquitoes. That includes species that are carriers of several potentially fatal diseases. “The problem is that Indiana is in the right climate zone to host mosquitoes that carry tropical diseases,” Filippelli said. Diseases such as Dengue fever, West Nile virus, Zika and malaria, which was eradicated from the U.S. in 1951, could develop here, especially in southern Indiana. 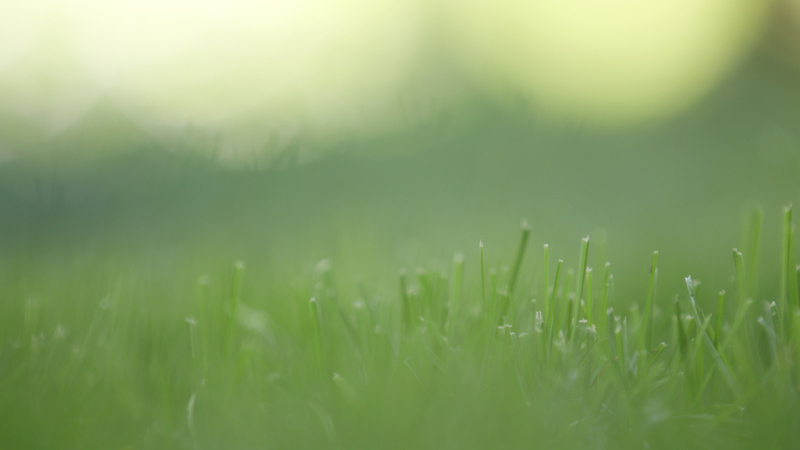 Dew collects on grass in Bloomington. “In the next 10 years, they’ll be moving up, sweeping through Indianapolis and up into the north part of the state,” Filipelli said. Climate change and the resulting hot and wet environment will also lead to an increase in the tick population and a rise in the number of people contracting Lyme disease due to tick bites, according to the report. Filippelli said Lyme disease cases in Indiana have risen 400 percent during the last 15 years. Lyme disease can be treated but could become a lifelong disease if neglected. Researchers also found that the changing climate will bring extended grief for allergy sufferers by amplifying the growing season for allergy-producing plants. Allergists in Indiana are already seeing those changes taking place. Dr. Daniel McCormack is an allergist and immunologist in Bloomington. He said more people are suffering from different types of allergies for a longer period of time. Climate change is here and researchers say it will affect people across the globe. Wayne Fant, for one, said he’s not sure how bad climate change will get, but he does know it’s already changing his life. Filippelli, who said facts point to human actions as the cause of climate change, said the decisions humans have made will guide the climate in the next century. Inaction, he said, will ensure that future generations will face the more extreme end of future projections. 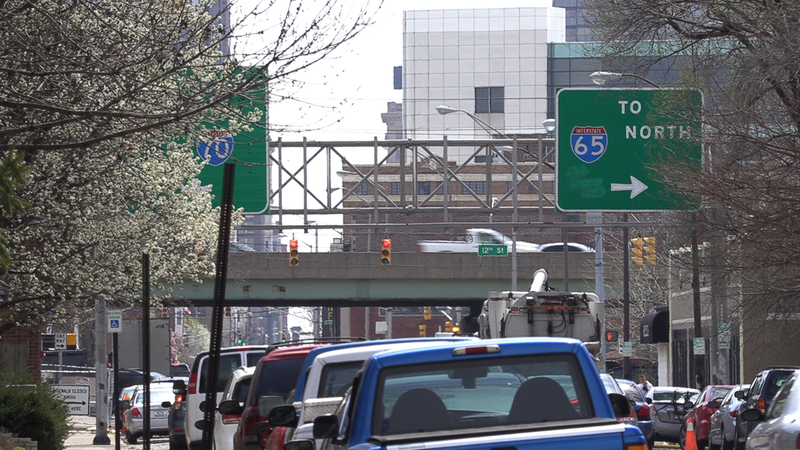 Commuters drive through Indianapolis during rush hour. He said it’s too late to fix the rising temperatures in the present, but we can make the near future a lot more livable through simple lifestyle changes such as turning off unnecessary lights and biking instead of driving. The important thing, Filippelli said, is that people need to figure out what kind of legacy they want to leave future generations. A new report reveals how climate change will affect the health of Hoosiers in the near future. More than 100 experts from more than 50 organizations across the state helped author Hoosiers' Health in a Changing Climate: A Report from the Indiana Climate Change Impacts Assessment. Researchers found that climate change will make people with preexisting chronic illnesses more vulnerable, potentially resulting in death. Climate change will also cause more frequent extreme rain events that will lead to flooding that causes sewer pipes to overflow, exposing people to disease. Climate change will also create the conditions that will let disease-carrying mosquitoes and ticks flourish and spread, and lengthen allergy season.